Energywire and The Wall Street Journal reported that the unnamed utility was Duke Energy, one of the nation’s largest, with 7.6 million retail electric customers in six states and 49,500 MW of generating capacity. The company told the Journal it does not comment on enforcement filings. In a Notice of Penalty filed Jan. 25, NERC cited 127 violations between 2015 and 2018 (52 posing “minimal” risk, 62 “moderate” and 13 “serious”). 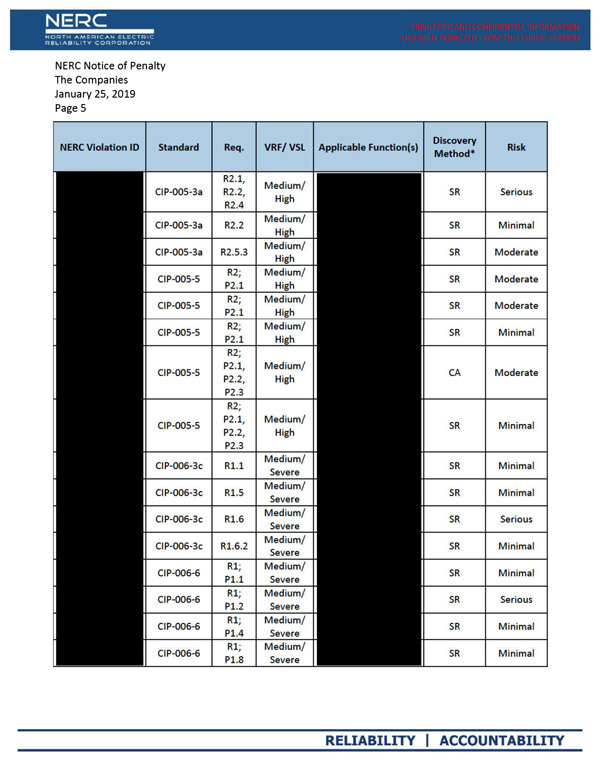 While most of the violations were self-reported, others resulted from compliance audits. 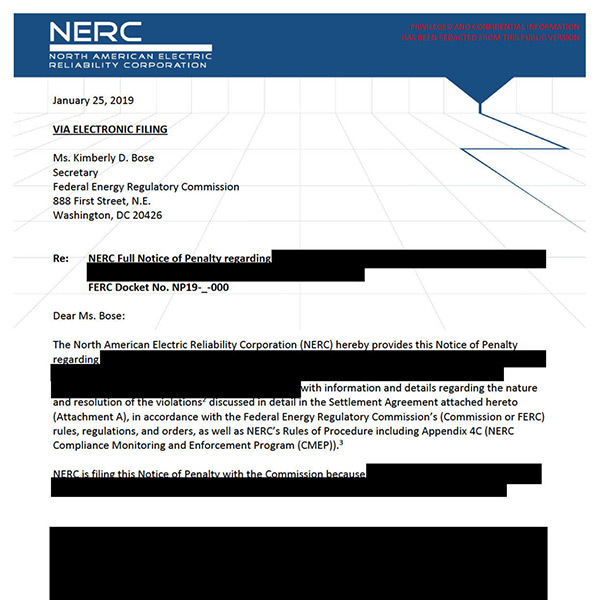 Although many of the details were redacted as critical energy/electric infrastructure information (CEIl), the document refers to “companies” and “regional entities” in the plural, suggesting a large, multistate utility was involved. There were also silos across business units “that resulted in confusion regarding expectations and ownership of tasks, and poor asset and configuration management practices,” NERC said. In a settlement, the companies agreed to pay the fine and to improve their performance by increasing senior leadership involvement and oversight; creating a centralized CIP oversight department; and restructuring roles to focus on standards, enterprise oversight, enterprise CIP tools, compliance metrics and regulatory interactions. They also agreed to conduct industry surveys and benchmark discussions to develop best practices. The companies also agreed to invest in enterprise-wide tools for asset and configuration management, visitor logging, access management, configuration monitoring and vulnerability assessments; increase training; and institute annual compliance drills. NERC said the penalty was based on the companies’ “repeat noncompliance” and “deficient” compliance program, mitigated by the lack of evidence of any attempt to conceal the violations. The settlement and fines are subject to approval by FERC. A failure to protect critical cyber asset (CCA) information. One-line diagrams lacked the appropriate NERC ClP classification markings and some employees were improperly granted “read-only” access to CCA information. A failure to follow its change control and configuration management process. In three instances, software upgrades were deployed on a single CCA in the production environment without first being tested as required by the change control process. A failure to maintain annual cybersecurity training for some employees with electronic or physical access to CCAs. A failure to timely revoke former employees’ and contractors’ electronic access rights. Allowing individuals improper electronic access to CIP-protected information. Improperly configured routers that prevented monitor server logs from being sent to the security incident and event management (SIEM) device. Firewalls were configured to allow external remote access to sensitive systems without first going through an intermediate system, using encryption or requiring multi-factor authentication. A failure to implement physical access controls to limit unescorted access to the physical security perimeter (PSP) and failing to document all required information in visitor logbooks. Repeated failures to adhere to cybersecurity testing procedures, including deficient testing on software upgrades and failures to implement security patch programs. Failing to change passwords on annual schedule and failing to change factory default passwords for remotely accessible BES cyber assets. NERC’s filing came days before intelligence officials told the Senate Intelligence Committee on Jan. 29 that Russian hackers have the capability to disrupt electrical service in the U.S.
“Moscow is now staging cyberattack assets to allow it to disrupt or damage U.S. civilian and military infrastructure during a crisis and poses a significant cyber influence threat,” officials said in the annual Worldwide Threat Assessment.